Russian antique brooch mandoline or domra with rose cut diamonds and enamel: Description by Adin Antique Jewelry. 94 rose cut diamonds all encrusted in silver carry you through this 14K red gold Russian Victorian brooch, starting from the stringed musical instrument's head with miniature tuning pegs and via the draping strap over to the body embellished with a diamond rim and blue enamelled inlay frills. 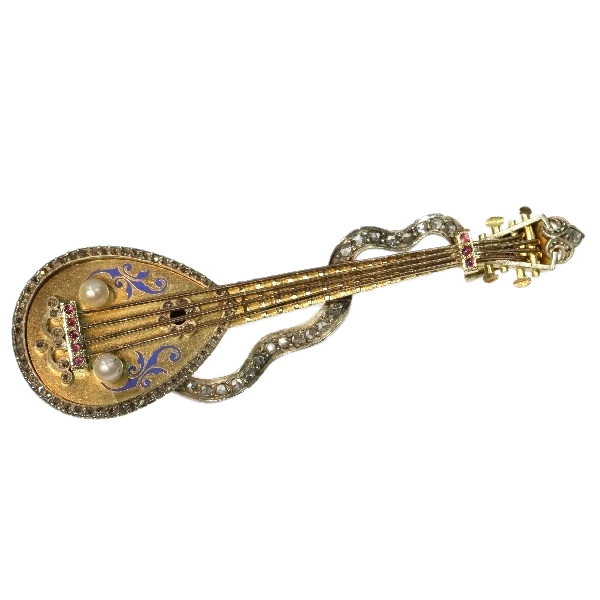 Besides the diamond sound hole and bridge, it's the eight cabochon cut rubies in the nut and the bridge pins and the two seed pearls next to the chords that make this mandolin reach its crescendo. Theme: Mandoline, or perhaps more likely the four string domra. Diamonds: 94 rose cut diamonds. We do not have the weight of the diamonds which is normal in our trade when it comes to rose cuts. Birthstones: Diamond is the birthstone (or month stone) for April, ruby for July and pearl for June. If this piece could only talk... What amazing story would we hear.